An Empaths sensitivity makes them particularly easy marks for energy vampires, whose fear or rage can sap their energy and peace of mind. These people can do more than drain an empathic physical energy, especially ones such as narcissists (who lack empathy and are only concerned with themselves) can make Empaths believe they are unworthy and unlovable. Empaths become replenished in nature. The natural world nourishes and restores them. It helps them release their burdens and they can take refuge in the presence of green wild things, bodies of water, the forest or a park. An Empaths nerves can get frayed by noise, smells or excessive talking. Empaths have a big heart and try to relieve the pain of others, it is natural for an Empathic person to want to reach out to these people and ease their pain. An Empath must learn how to use strategies to protect their sensitivities, such as setting limits and boundaries with draining people, meditation to calm and recenter, and going out into nature. Being an Empathic person is a wonderful gift, but you must learn how to take care of your self and remind your self of your limits also. Hearing and watching violence on TV or in newspapers can cause an Empath sadness, or anxiety or to cry usually because they actually put themselves in other people’s shoes, what is hurting someone else becomes their own hurtful feelings. 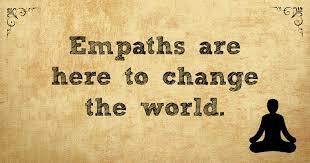 Empathic have great intuitive skills because of their sensitive personality, Empathic individuals can easily recognize the slightest emotional or physical change in someone’s attitude, body language, facial expressions or demeanor so it is not unusual for an Empath to spot a liar or an honest and good person. Empaths need to know the truth about what goes on, they do not like secrets. Empathic individuals are highly creative people, they love to put their energies into singing, painting, acting, writing, creating with wood, pottery or other natural materials. They are Souls who can appreciate the art of any kind on a deeper level than most people.